Ireland’s thumping win over the West Indies in Nelson this week was yet another layer of highlighting on the ridiculous decision to trim the 2019 Cricket World Cup back to just 10 teams. Cricket must be one of the few professional sports in the world to believe it’s possible to grow the game globally by making qualification for the peak competition in the sport even harder. There’s no doubt the pool stage of this tournament is dragging on and will continue to drag on for several weeks yet. Darren Lehmann suggested that the pool stage could easily be condensed from its current 42-games-in-30-days format, and he’s right. However condensing the tournament doesn’t have to mean trimming teams, which unfortunately is what will happen once we start tracking towards the 2019 tournament. Because the lesser-fancied teams make the pool stages interesting. I was sitting in a radio studio on Monday afternoon while Ireland wrapped up their wonderful win, and despite talking about other sporting stories live to air, there was a real excitement around the final overs as the Irish team wobbled a little at the final hurdle. All we wanted to be able to do was to say, “…and Ireland have now beaten the West Indies”. We were eventually able to give the live update, but only after hastily discussing a couple of other topics while we waited, all the while watching the monitor and following the mobile app text updates. Now that they have beaten the West Indies, Ireland are absolutely ripe to take fourth place in Pool B as I suggested last week. The Windies-Zimbabwe match in Canberra next Tuesday suddenly takes on extra significance, as does Zimbabwe-Ireland in Hobart on March 7. Zimbabwe looked to be setting up the first major boilover of the tournament when they had South Africa 4/83 in the 21st over in Hamilton on Sunday. With Quinton de Kock, Hashim Amla, Francois du Plessis and AB de Villiers all in the sheds, the ‘Zimboks’ would’ve been excused for feeling confident. And sure, that ended up being the high point of their day, the 105-run second wicket stand between Chamu Chibhabha and Hamilton Masakadza notwithstanding. But a Zimbabwean attack bringing one of the better top orders in world cricket to its knees was fantastic to see. They’ll fancy their chances against the West Indies, who on current form might battle to win a game. Pool A looks a tad more settled, and it’s just as difficult to see Australia, New Zealand, England, and Sri Lanka not finishing in the top four as it is to work out who of Scotland, Afghanistan, and Bangladesh might cause the equivalent of Ireland’s big win. That said, Scotland came back very well to post 142 in Dunedin on Tuesday, after slumping to 4/12 after 26 balls. In the end the fighting partnership between Matt Machan and Richie Berrington was the difference between the match finishing before or after lunch as it did. And though the Black Caps chased the target inside 25 overs, they lost seven wickets getting there, with 4/31 falling in the final stages to make things less comfortable than they should’ve been. In one of those great obscure stats that only cricket seems to be able to produce, New Zealand’s three-wicket win with 151 balls to spare was the smallest winning margin achieved with the largest chunk of an ODI match still to play. Yesterday in Canberra we were treated to a match that had everything, between Bangladesh and cricket’s new darlings, Afghanistan. The Afghans bowled superbly, tying Bangladesh right down to 2/67 off the first 20 overs on a ground where 300 is very gettable. Shakib Al Hasan and Mushfiqur Rahim looked like they would set a big total for Bangladesh, adding 115 from 93 balls for the fifth wicket. But al Hasan was knocked over in the 45th over just when a par score at Manuka Oval looked likely, and Bangladesh lost 6/34 at the end of their innings, leaving Afghanistan 268 to win. The predominantly Bangladeshi crowd were then in raptures as their team took three wickets in the first three overs – the first two of which I only knew of because of the deafening noise (I may or may not have still been enjoying the plentiful ICC-funded catering at the time). The crowds have got behind the minnows in big numbers too. At Manuka yesterday I spoke to Bangladeshi fans who had travelled down from Sydney, and Afghani fans who’d driven up from Melbourne. South African commentator Neil Manthorp, in town to cover the game for the combined ABC/BBC coverage, found Afghan fans who had made the 1200 kilometre trek from Adelaide! 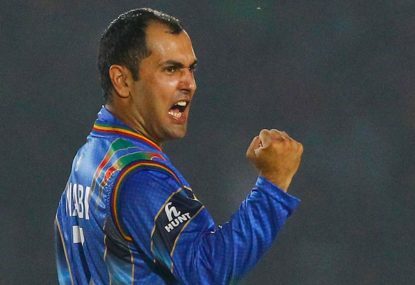 Bangladesh won pretty comfortably in the end, but Afghanistan earned themselves plenty of new supporters for the way they recovered from the early collapse. They let themselves down with some ordinary shot-selection eventually, and went down swinging to lose by 105. But this is what we want from these teams. We know the favoured teams will get through, so they’ll treat the pool stages as warm-up games and centre wicket nets as they get their combinations right. So we have to look elsewhere for the feel-good stories and the unexpected excitement. And while there’s a multitude of reasons why cutting back to 10 teams is mind-blowing dumb, this is one of the biggest ones. The Associate Members and the lower ranked teams have a place in the Cricket World Cup, but like all good ICC decisions, the almighty rupee will ultimately win out.